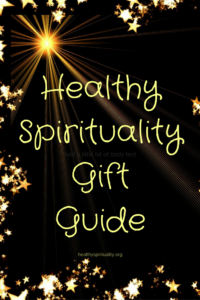 I love giving and sharing great gift ideas, knowing I am nourishing both my faith and those of my loved ones and friends. Below are some ideas I have recently compiled for holiday gift giving. Hope you enjoy this special edition of Healthy Spirituality. Shacke Packing Cubes – What did I ever do without these? My clothes are less wrinkled (though they have a few creases when I rush the packing) and fit into smaller suitcases. I love this product! A great jewelry collection. 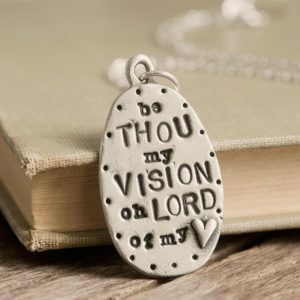 I especially like the “Be Thou my Vision Necklace” as that is one of my most favorite hymns. 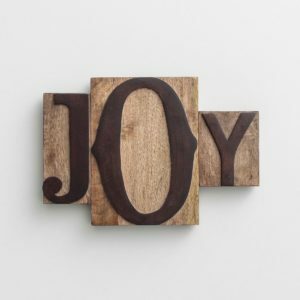 Word Matter Letter Box Collection of wall art is both inspirational and beautiful. Since my fourth grandchild was born in October I have been going crazy with Christian baby gift ideas. Check out what Dayspring offers for newborns here. Mere Spirituality – the Spiritual Life According to Henri Nouwen by Wil Hernadaz. I recently used this book as the foundation for a multi-day retreat. Lots to ponder and learn from these words. Henri Nouwen: Eight Essential Titles – a collection of 8 of the book by my favorite author. Word by Word: A Daily Spiritual Practice by Marilyn McEntyre. I am using this plus the book listed below for my morning devotions. Desert Banquet – A Year of Wisdom from the Desert Mothers and Fathers by David Keller. I have learned so much from this book and my walk with these ancient wise ones. Conquer Your Year – the Ultimate Planner by Natalie MacNeil. I’m using this planner currently. Altar in the World – A Geography of Faith by Barbara Brown Taylor. My small group is slowly reading this and loving it. Fun Socks –Bookworm Socks – I bought this for a sock hop at a writers conference and they still make me smile and keep my toes warm. Fair Trade Coffee – Don’t come between a girl and her coffee, especially when she is writing. And I always am looking for spiral bound lined journals. Journaling is an essential faith practice for me and I am encouraging even my 7-year-old granddaughter to start. Spiritual Retreats: A Guide to Slowing Down to be with God. Monthly Musings – A journal to capture your moments every month. Disclaimer: Some of these links may be affiliate links. This mean if you make a purchase after clicking on one of the link, I may receive a small commission to help support the Healthy Spirituality site, at no additional cost to you. Thank you for your support.